Healing naturally in an unnatural world. Hey there! Thanks for dropping by I Told You I Was Sick! Take a look around and grab the RSS feed to stay updated. See you around! The father of medicine knew what he was talking about. While modern or “allopathic” medicine has been around for only a little over one hundred years, natural medicine (including the use of kitchen herbs as medicinals) has been around for millennia. Garlic is personal favorite of mine. I discovered its benefits when I was doing some research on candida and how to cure it naturally. Garlic is a powerful antifungal and antibacterial and can prevent a cold when taken regularly and/or speed up the healing process when sick. Because of its blood cleansing properties, garlic has been known to improve in the healing of acne, high cholesterol and blood clots. The best way to eat garlic is to cut or chop it up and put it into food raw. Putting garlic in the microwave kills the active ingredients so if you plan to heat it up, do so by stovetop or oven. When cooking food, it is best to wait until the last ten minutes before adding the garlic so as not to “cook out” all of the active ingredients. If you’re interested in the benefits of garlic but are concerned about garlic breath, you can take a garlic supplement instead. Below, I’ve included a recipe I concocted when sick a few months back. If you’ve got a cold or bacterial infection, this recipe packs a wallop! Pour the tomato juice into a 4 oz glass, chop or mince one to two cloves of garlic and add it to the juice, then add the rest of the spices. Mix it all together with a teaspoon and down the hatch. It will clear our your sinuses and may burn a little going down. Remember to always use care especially with cayenne pepper, as it is a hot spice. 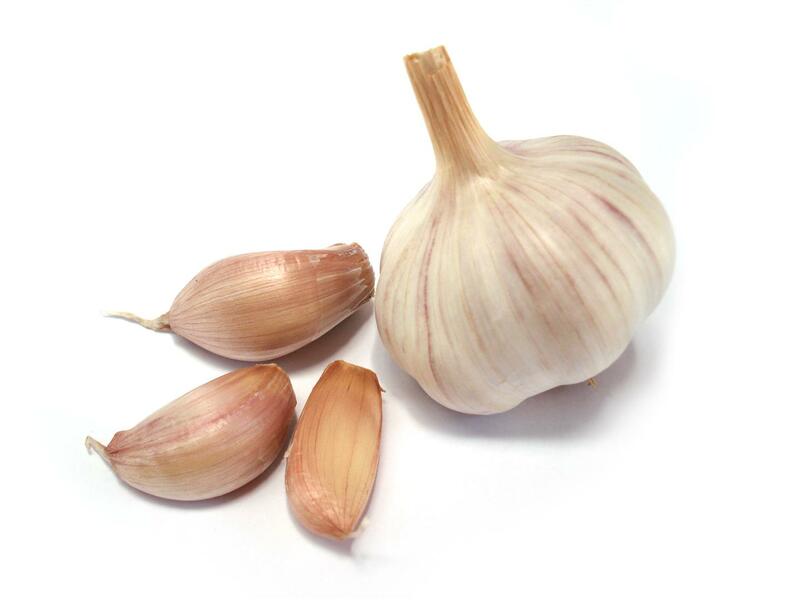 If you are on an anticoagulant (blood thinner), consult with your health care provider before using garlic. Excessive garlic consumption can aggravate the digestive system so start slowly to see how your body will react. If you have any other concerns, consult your health care provider. For more healthy, natural products I recommend check out the Product Review Page on my website.